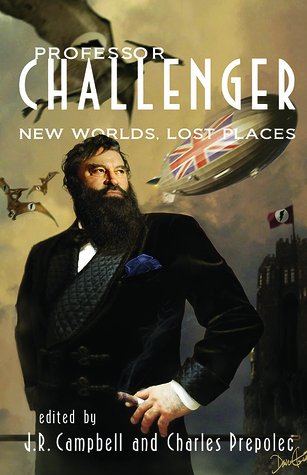 This anthology of new stories featuring Arthur Conan Doyle's Professor Challenger includes several crossovers. In Lawrence C. Connolly's "King of the Moon," Bedford, Challenger, Ann Cavor and a pair of father-and-son inventors rescue Ann’s uncle from the Selenites. Bedford, Dr. Cavor, and the Selenites are from H.G. Wells’ The First Men in the Moon, which is described as having taken place ten years ago. Bedford implies here that he is the one who put Challenger in contact with Arthur Conan Doyle. Challenger must have introduced Doyle in turn to Edward Malone. Doyle became Malone’s literary agent and editor, publishing the reporter’s accounts of his adventures with Challenger under his own byline. In Josh Reynolds' "Time's Black Gulf," Professor Summerlee, Lord John Roxton, Malone, and Thomas Carnacki battle Indrid Cold and other members of his race, who are part of a conspiracy to infiltrate the human race at every stage of its evolution along with an alien race that has swapped Challenger’s consciousness with that of one of their own people. Challenger has copies of Cultes des Goules and Unaussprechlichen Kulten. Carnacki refers to the Sigsand Manuscripts, the Book of Eibon, the Pnakotic texts, the Florentine monk Corsi, and Khephnes. The Tind’Losi, the Hounds of the Angles, appear. Dr. John Silence and Jessie Challenger ultimately save the day. Thomas Carnacki and the Sigsand Manuscripts are from William Hope Hodgson’s Carnacki the Ghost-Finder. Indrid Cold is a supposedly real person connected to the Mothman sightings of 1966-1967. Here, he is also a member of the race of creatures seen in H.P. Lovecraft’s "The Festival." This version of Cold also appears in Reynolds’ stories "The Pnakotic Puzzle" and "The Yoth Protocols." "The Pnakotic Puzzle” indicates that this story happened “some years before the war.” The consciousness-swapping alien race is the Great Race of Yith from Lovecraft’s "The Shadow Out of Time. "Bartolomeo Corsi and Khephnes are also from "The Shadow Out of Time." The Cultes des Goules is a Cthulhu Mythos tome created by Robert Bloch. Unaussprechlichen Kulten is a Mythos tome created by Robert E. Howard. The Book of Eibon is from Clark Ashton Smith’s contributions to the Mythos. The Pnakotic texts are a reference to Lovecraft’s Pnakotic Manuscripts. The Tind’Losi are from Frank Belknap Long’s story "The Hounds of Tindalos." Dr. John Silence is an occult detective featured in stories by Algernon Blackwood. In John Takis' "The Crystal Minders," Challenger suggests that a scientist has "invented a machine capable of traveling through time, like that loon in Surrey, have you?" “That loon in Surrey” is the Time Traveler from H.G. Wells’ The Time Machine. This story is primarily narrated by Professor Summerlee, though a framing sequence narrated by Edward Malone involves Summerlee coming to the reporter to tell him of the adventure. Malone refers to the events of “The Disintegration Machine” in passing as a past event. 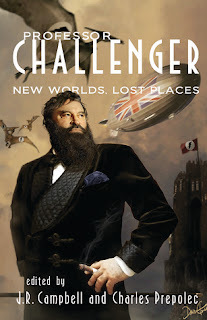 This creates a chronological conflict, as Rick Lai’s essay “The Anomaly of Professor Challenger’s Daughter” (Rick Lai’s Secret Histories: Daring Adventurers, Altus Press, 2008) places both “The Disintegration Machine” and The Land of Mists in 1926. According to The Land of Mists, Summerlee died “last year,” i.e., in 1925. Therefore, the reference to “The Disintegration Machine” must be obfuscation on Malone’s part, similar to Dr. Watson providing false dates in his accounts of Sherlock Holmes’ cases. In Andrew J. Wilson's "Out of the Depths," set in 1937, Challenger and Malone encounter Nazis in Maple White Land. Hobbs Lane is from the British television science fiction serial Quatermass and the Pit, although there it is located in Knightsbridge, rather than Kensington. Doctor Moreau is from H.G. Wells’ novel The Island of Doctor Moreau. The Lidenbrock Sea is from Jules Verne’s novel Journey to the Centre of the Earth. Medusa Von Juntz is related to Friedrich Von Juntz from Robert E. Howard’s “The Black Stone.” Doctor Moreau is revealed to have been Jack the Ripper, placing this story outside CU continuity. In Guy Adams and James Goss' "Professor Challenger and the Crimson Wonder," Challenger and his wife have a run-in with aliens who are planning to overrun the world with a remarkable plant. Mycroft Holmes is Sherlock Holmes’ brother. Lidenbrock is Otto Lidenbrock from Journey to the Centre of the Earth. Cavor is from Wells’ The First Men in the Moon, as previously stated. Abner Perry is from Edgar Rice Burroughs’ Pellucidar novels. William Dyer is from H.P. Lovecraft’s “At the Mountains of Madness.” Herbert is meant to be the Time Traveler from Wells’ novel. Herakleophorbia IV, Bensington, and Miss Cossar’s brother are from Wells’ novel The Food of the Gods. Ryland and the Great Four are from Agatha Christie’s novel The Big Four. The meteorite that landed in Woking in 1898 is from Wells’ novel The War of the Worlds. This story is too overtly satirical to fit easily into CU continuity. Also, Poirot moved to England in 1916, so the portrayal of him as an agent of Mycroft Holmes in 1914 is chronologically incorrect. I accidentally rejected rather than approved a comment from Andrew J. Wilson. Apologies. Here's Andrew's comment, "Hi there!